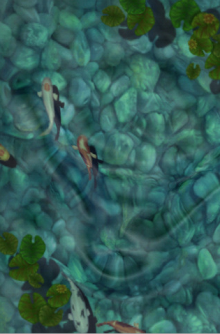 Who could have predicted that the persistent #1 paid application on the iPhone would be a $0.99 pond simulator. The Blimp Pilot's Koi Pond [$0.99. App Store] application that is just that. Imagine gazing into a pond of crystal clear water. Picture bright, playful koi swimming through its shallow depth. So close... Can you touch them? You run your fingers across the cool surface of the pond. Water ripples away from your touch. The koi, disturbed, dart away. Only to quickly forget and swim close to you once more..."
Like others, we thought its popularity to be a fluke. But Koi Pond has held the top spot in the iTunes App Store for weeks now. It only sees temporary dips to 2nd place when a formerly popular free application decides to start charging for their app. This small dip never lasts though. Here's a video of the newest version of Koi Pond which appeared in the App Store this week.